All the below links and excerpts (incl Figures 6-8 & 10-12) are in English. 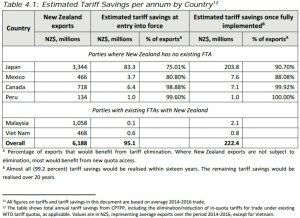 … Is the endgame of a TPP11 solely its economic benefits, primarily in trade in goods and services? How should the eleven TPP countries deal with issues on which U.S. policy is shifting? Should potential losses for the U.S. from opting out be used to try and bring the Americans back to the TPP table to regain the additional benefits for all (and avoid aggressive bilateral talks)? If so, what changes, if any, should be made to the pact to either facilitate the Americans’ return to the table or, on the other hand, to try and extract concessions from them as a price for re-entry? ⭢ Canada stands to benefit in TPP11 compared to TPP12 more than any other country in the group, save Mexico. 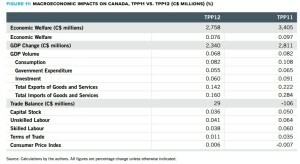 Canada’s welfare gains would improve to C$3.4 billion under the TPP11, compared to C$2.8 billion in TPP12. Real GDP gain improves to 0.082%. from 0.068%. ⭢ A TPP11 would actually be better than the original agreement for Canadian agriculture and agri-food, because this sector would no longer compete with the U.S. in TPP11 markets. Beef, in particular, would benefit from access to the Japanese market without having to share with the Americans. 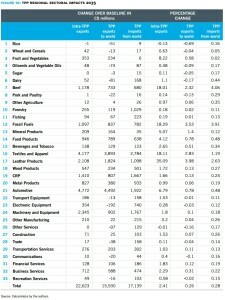 Fruit and vegetable exports, processed food products, and pork and poultry would likewise do well. 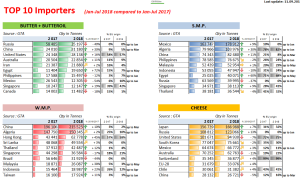 Canola would continue to see a significant change in the composition of exports from unprocessed oilseeds to crude and refined canola oil, due to the elimination of Japan’s tariff escalation policy in the oilseed sector. 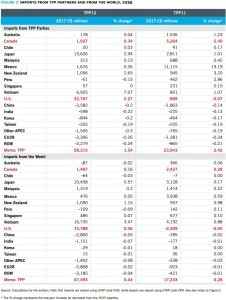 ⭢ Canadian textiles and apparel – another sensitive sector – would see only a moderate reduction in total shipments, despite a strong surge of imports from TPP11 partners (again, this is unchanged from TPP12). ⭢ The impact on the automotive sector is neutral in the new modelling results, but much would depend on how a TPP11 would proceed on the rules of origin (ROOs), given the central role of U.S.-based producers in TPP automotive supply chains. ⭢ A TPP11 would improve upon TPP12 for signatories in the Americas (Mexico, Canada, Peru and Chile), as these countries would avoid erosion of existing preferences in the U.S. market (assuming existing bilateral agreements remain unchanged). These countries would also benefit from not having to compete with U.S. suppliers, as they would have had to under TPP12. ⭢ A TPP11 would improve upon TPP12 for Singapore, which similarly would avoid loss to U.S. competition of its existing preferential position in Asian markets. 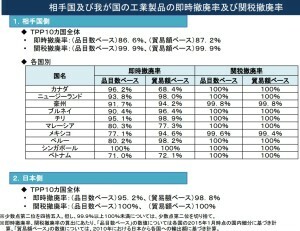 ⭢ Vietnam and Japan, while they would still benefit from TPP11, would also see the biggest reduction of gains, because they stood to gain the most in the U.S. market under TPP12. ⭢ Notwithstanding the withdrawal of the U.S., the automotive sector would make the largest intra-TPP export gains of all the goods sectors under TPP11. ⭢ Other sectors that would benefit from increased exports under TPP11 include machinery and equipment (C$2.3 billion), leather products (C$2.1 billion), beef (C$1.2 billion), processed foods (C$946 million) and fruit and vegetables (C$343 million). ⭢ The TPP11 would wash out the large export gains that Vietnam stood to make in textiles and apparel in the U.S. market under TPP12. 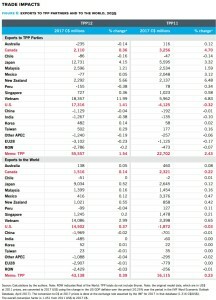 Nonetheless, textiles and apparel (C$4.2 billion) see the largest gains in intra-TPP exports after automotive products. ⭢ Finally, service exports get little wind in the sails from TPP11. 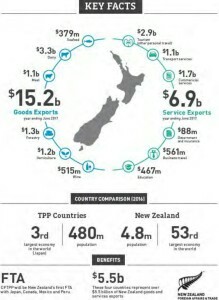 Business services exports make the most notable gain, expanding by C$345 million, but this falls far short of what TPP12 would likely generate. 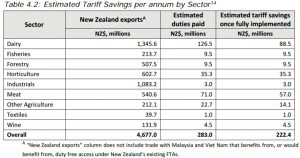 01 Does TPP11 make sense for the eleven as a standalone agreement? 02 Does the existence of TPP11 give signatories leverage in potential bilateral (or in the case of nafta, trilateral) negotiations or renegotiations with the U.S.? 03 Could the losses to the U.S. due to its exclusion from the tpp bring the Americans back to the table? 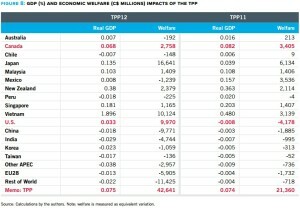 Essentially, could TPP11 be a path to realizing or re-achieving the larger political and economic benefits of a TPP12? … If a company in Japan that produces goods with inputs from Malaysia and Vietnam wanted to sell to Canada, it could enter Canada under the favourable conditions of TPP11 since all the countries were members of the agreement. 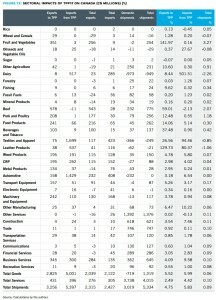 Figure 1: Income and Population, estimated 2016, TPP11 and the U.S.
15. With Japan, Australia has secured increased access for many products under the Japan-Australia Economic Partnership Agreement (JAEPA), but will continue to face high tariffs and quota-limited access on Japan’s sensitive products. In dairy, products face ad valorem tariffs ranging up to 40 per cent and specific tariffs up to \1,199/kg ($12.62/kg). Beef tariffs, while significantly reduced under JAEPA, would still be as high as 23.5 per cent after 15 years. Wheat and barley face tariffs of up to \50/kg ($0.58/kg) and \39/kg ($0.45/kg) respectively, rice is subject to a \341/ kg tariff ($3.93/kg) and sugar is subject to a levy on high polarity sugar of 103.10 yen/kg ($1.19-kg). A range of tariffs also remain on other Australian interests in horticulture and seafood. 19. Access into the Canadian dairy market is currently significantly limited by existing quota and high tariff arrangements. Canada’s quota access for dairy products is incredibly small – for example, 332 tonnes for yoghurt, 394 tonnes for cream and 3,274 tonne for butter (2,000 tonnes of which are allocated to New Zealand). While out-of-quota tariffs range up to 369 per cent. Outside of dairy, Canada also imposes tariffs of up to 94 per cent for barley products, and imposes tariffs of 1.87 c/litre for wine, and up to around 20 per cent on industrial products, which it has eliminated for its other FTA partners. 20. Mexico has tariffs of up to 67 per cent on wheat, 115.2 per cent on barley, 125 per cent on dairy, 25 per cent on beef, and 20 per cent on wine. On industrial products, Mexico’s tariffs can range from 15 to 30 per cent for automotive parts or mining equipment. 113. 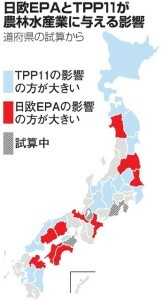 A TPP-11 Commission established under the Agreement will be responsible for the operation of the TPP-11. The Commission will review the operation of the TPP-11 three years after entry into force of the Agreement and at least every five years thereafter. If the entry into force of the original TPP is imminent or if the original TPP is unlikely to enter into force, the Parties have agreed to, on the request of a Party, review the operation of the TPP-11 so as to consider any amendment to the Agreement and any related matters. 114. After the entry into force of the TPP-11, any state or separate customs territory may accede to the TPP-11 if it is prepared to comply with the provisions of the Agreement, other terms and conditions specified, and if all TPP-11 Parties agree to the accession. 115. Any Party may withdraw from the TPP-11 by providing written notice to the Depositary and other Parties. A withdrawal shall take effect six months after a Party provides written notification, unless the Parties agree on a different period. 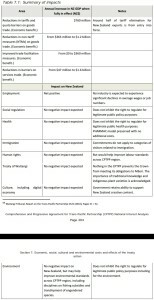 pp8-16 Annex 1: Previous Parliamentary Inquiry recommendations and resultant actions. … Australia held similar positions in the 1950s but its ranking slipped over the following two and a half decades. It dropped to 15th in 1983 and again in 1991 and 1992. Since then Australia’s international ranking has risen. This improvement has been linked to sustained economic reforms during the 1980s and 1990s, including: the opening up of trade and capital markets to competition; partial deregulation, commercialisation and privatisation of state owned enterprises; labour market reforms that reformed the centralized wage fixing system; and National Competition Policy reforms (PC 1999). These resulted in better utilisation of labour and capital by business and enabled the Australian economy to innovate, taking advantage of newly developed information and communication technologies. 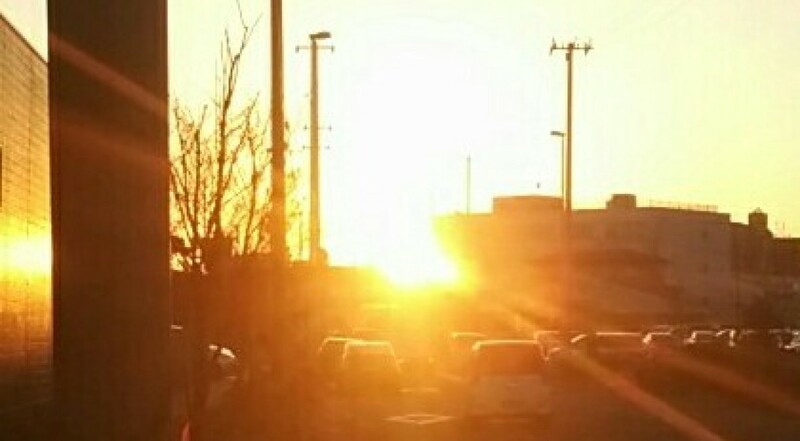 All the below links and excerpts are in Japanese. Next post about this topic will be in English. All the links and tweets are in English. That bowling ball test Trump made up is likely an attempt to reference Japan's strict regulatory inspection process for automobiles. Japan’s role, alongside the EU & US, in perpetuating the expansion of #IP rights beyond #TRIPS is part of a damaging trend for #access2medicines. Countries hurt most by steel tariffs: Canada, Brazil, South Korea, Mexico. Countries hurt most by Trump's w/d from TPP: Canada, Mexico, Japan, Australia.